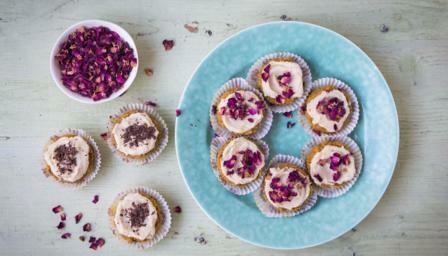 These vegan cupcakes are deliciously moist, thanks to their secret ingredient: butternut squash. Each cupcake provides 234 kcal, 2g protein, 21g carbohydrate (of which 7.5g sugars), 16g fat (of which 12g saturates), 1.5g fibre and 0.1g salt. Preheat the oven to 180C/160C Fan/Gas 4. Line a 12-hole cupcake tray with paper cases. Blend all of the cupcakes ingredients and 3 tablespoons water together in a food processor until smooth and well combined. Divide the batter equally among the cupcake cases (about 3 tablespoons per paper case). Bake for 18-20 minutes, or until a skewer inserted into the centre of the cupcakes comes out clean. Remove the cupcakes from the tin and set aside to cool on a wire rack until completely cold. Meanwhile, whip the icing ingredients together with an electric whisk until light and fluffy. Chill in the fridge until the cupcakes have cooled, then whip again. Transfer the tahini maple icing to a piping bag and ice the cupcakes. Sprinkle with the rose petals or grated vegan chocolate and serve.